Hamed Abdel tawab Samaha, Yasser Nasr Haggag, Mohammed Al sayed Nossair, Heba Mohammed Habib. The effectiveness of four commercial disinfectants including ammonium hydroxide, phenol, Eco.Bio (combination of QACs and gluteraldehyde) and Virox (combination of peracetic acid and hydrogen peroxide) was evaluated against unsporulated E. tenella oocysts which were obtained from naturally infected birds with ceccal coccidiosis then propagated in broiler chicks reared on wire cage and fed anticoccidial free starter ration from day one of rearing till the end of experiment. The oocysts were exposed to the disinfectants at different concentrations and different contact times. In addition, the effect of some environmental factors including temperature, pH and presence of organic matter on the efficiency of these disinfectants was also studied. Based on obtained results of the current study, it was observed that the most effective disinfectants against unsporulated E. tenella oocysts were ammonium hydroxide 5% and 10%, Phenol 10%, while Eco. Bio and Virox were less effective. Also, the results proved that the inhibitory activity greatly increased by increasing concentration or contact time or both for all tested disinfectants. While increasing the temperature factor, increased the efficacy of all tested disinfectants except Virox. In addition, for the factor of presence of organic, the results revealed that organic matter (10% chicken faeces) reduced the efficacy of both Virox and Eco.Bio disinfectants by 52.9% and 47%, respectively. While Ammonium hydroxide and Phenol disinfectants not affected by this factor. Finally, the highest efficacies of both Ammonium hydroxide and Eco.Bio disinfectants were obtained at alkaline pH, while for Phenol and Virox were active at acidic pH. Key words: Disinfectants, E. tenella oocysts , coccidiosis. Allen, P. C. and Fetterer, R. H. 2002: Recent Advances in Biology and Immunobiology of Eimeria Species and in Diagnosis and Control of Infection with These Coccidian Parasites of Poultry. Clin.Microbiol. J. 15 (1), 58-65. Amass, S. F., Ragland, D. and Spicer, P. 2001: Evaluation of the efficacy of a peroxygen compound, Virkon(R) S, as a boot bath disinfectant. Swine Heal. Prod. 9 (3):121-123. Amass, S. F., Vyverberg, B. D., Dowell, C. A., Anderson, C. D., Stover, J. H., Beaudry, D.J. 2000: Evaluating the efficacy of boot baths in biosecurity protocols. Swine Heal. Prod. 8(4):169-173. Baldry, M. G. C. and French, M. S. 1989: Activity of peracetic acid against sewage indicator organisms. Water Sci. Technosl., 21, 1747â€“1749. BC Center for disease control (BCCDC) Laboratory Services 2003: A Guide to Selection and Use of Disinfectants. Berchieri, A. and Barrow, P. A. 1996: The antibacterial effects for Salmonella Enteritidis phage type 4 of different chemical disinfectants and cleaning agents tested under different conditions. Avian Pathol. 25, 663-673. Bessems, E., 1998: The effect of practical conditions on the efficacy of disinfectants. Int. Biodeterioration & Biodegradation 41, 177-183. Block, S.S. 2002: Peroxygen compounds. Chapter 9 in disinfection, sterilization, and preservation. 5th Ed. Conway, D. P. and McKenzie, E. M. 2007: Poultry Coccidiosis Diagnostic and Testing Procedures. 3rd Ed, Blackwell Publishing Professional. Dalloul, R. A. and Lillehoj, H. S. 2006: Poultry coccidiosis: recent advancements in control measures and vaccine development. Expert Rev. Vaccines 5:143-163. Daugschies, A., Bose, R.; Marx, J., Teich, K. and Friedhoff, K.T. 2002: Development and application of a standardized assay for chemical disinfection of coccidia oocysts. Vet. Parasitol. 103 (4), 299-308. Desouky, A. Y. and El-Midany, S. A. 2003: Evaluation of the efficacy of some different disinfectants commonly used in poultry farms against coccidial oocysts. EVMSPJ, 1(1), 151- 157. Duong, N. T. H. 2005: The Sanitizing Efficiency Of Different Disinfectants Used In The Fish Industry. UNU â€“ Fisheries Training Programme. Dvorak, G. 2005: Disinfection 101. Center for Food Security and Public Health. Iowa State University. Fayer, R., Speer, C. A., and Dubey, J. P. 1997: The general biology of Cryptosporidium, p. 1â€“41. In R. Fayer (ed. ), Cryptosporidium and cryptosporidiosis. CRC Press, Boca Raton, FL. Finlay, R. C., Roberts, S. J., Hayday, A. C. 1993: Dynamic response of murine gut intraepithelial T cells after infection by the coccidian parasite Eimeria. Eur. J. Immunol. ; 23:2557â€“2564. Gehr, R., Cochrane, D., French M., 2002: Peracetic acid as a disinfectant for municipal wastewaters: encouraging performance results from physicochemical as well as biological effluents. Proc. of the U.S. water environment federation disinfection conference. Goddard, P. A. and McCue, K. A. 2002: Phenolic compounds. Chapter 13 in: disinfection, sterilization, and preservation. 5th Ed. Horton â€“ smith, G., Taylor, E. L. and turtle, E. E. 1940: Ammonia fumigation for coccidial disinfection. Vet. Rec. 52, 829- 832. Jeffrey, D. J. 1995: Chemicals used as disinfectants: Active ingredients and enhancing additives. Rev. Sci. tech. Off. int. Epiz.14 (1):57-74. Junior, J. S., Bogado, A. L., Da Cunha, T. C. and Garcia, J. L. 2007: In vitro Evaluation of the disinfection efficacy on Eimeria tenella unsporulated oocysts isolated from broilers. Rev. Bras. Parasitol. Vet., 16, 2, 67-71. Kennedy, J., Bek, J. and Griffin, D. 2000: Selection and Use of Disinfectants. Published by University of Nebraskaâ€“Lincoln extension, institute of agriculture and natural resources. Kitis, M. 2004: Disinfection of wastewater with peraceticacid: a review. Env. Int. 30 (1), 47â€“55. Langsrud, S. and Sundheim, G. 1997: Factors contributing to the survival of poultry associated pseudomonas spp. exposed to a quaternary ammonium compound. Appl. Microbial., 82 (6), 705- 712. Lensing, H. H., and Oei. H. L. 1984: Study of the efficiency of disinfectants against anthrax spores. Tijdschr. Diergeneeskd. 109:557â€“563. Lillehoj, H. S. and Lillehoj, E. P. 2000: Avian coccidiosis. A review of acquired intestinal immunity and vaccination strategies. Avian Dis. ; 44:408â€“425. LongXian, Z., ChangShen, N., KaiHuai, L., Li, C. and JianYong, M. 1999: Evaluation of selected disinfectants against avian coccidial oocysts. Chin. J. of vet. Med. 25: 10-11. Malchesky, P. S. 1993: Peracetic acid and its application to medical instrument sterilization. Artif. Organs 17:147â€“152. Martinez, F., Berchieri, A. Jr. and Paulillo, A. C. 1999: The effect of disinfectants on salmonella in the presence of organic matter. Revista- Brasileira- de- Ciencia- Avicola. 1 (1): 17 â€“ 25. McDonnell, G. and Russell, A. D. 1999: Antiseptics and Disinfectants: Activity, Action, and Resistance. Clinical Microbiol. Reviews. 12 (1), 147-179. Morishita, Teresa. Y. and Gordon, J. C. 2002: Cleaning and Disinfection of Poultry Facilities. VME- 013-02â€“page 1- 6.ohioline.osu.edu. National Seafood HACCP Alliance, 2000: Seafood HACCP Alliance Course. Chapter 2: Condition and cleanliness of Food contact surfaces. Seafood.ucdavis.edu/sanitation/Ch2points.rtf. Nematollahi, A; Moghaddam, Gh. and Niyazpour, F. 2008: Prevalence of Eimeria sp. among broiler chicks in Tabriz (Northwest of Iran).Res. J.of poult. Sci., 2(3):72-74. Oliveira, M. R., Longhi, E., Ono, L. M., Zulpo, D. L. and Peretti, J. 2004: EficÃ¡cia de inibiÃ§Ã£o da esporulaÃ§Ã£oemoocistos de Eimeria de avestratados com desinfetantes de usocomercial. In: ENCONTRO ANUAL DE INICIAÃ‡ÃƒO CIENTÃ�FICA, 13, 2004, Londrina. Anais. Londrina: UEL, 2004. Payne, J. B., Kroger, E. C. and Watkins, S. E. 2005: Evaluation of disinfectant efficacy when applied to the floor of poultry growout facilities. J. Appl. Poult. Res. 14:322â€“329. Queiroz de Souza, R., Torres, L. M., Graziano, K. U. and Turrini, R. N. T. 2012: Microorganisms of the Coccidia subclass: resistance and implications for the aseptic processing of healthcare products. Rev. esc. enferm. USP.46 (2) 466-471. Quinn, PJ. and Markey, BK. 2001: Disinfection and disease prevention in veterinary medicine. In: Block SS, editor. Disinfection, sterilization and preservation. 5th Ed. Philadelphia: Lippincott, Williams & Wilkins. ; pp1069-1103. Rodgers, J. D., Me Cullugh, J. J., Me Namee. P. T., Smyth, J. A. and Ball. H. J. 2001: An investigation into the efficacy on hatchery disinfectant against strains of Staph. Aureus associated with poultry industry. Vet. Microbial. 82 (2) 131 â€“ 140. Russell, A. D. 1999: Factors influencing the efficacy of antimicrobial agents. In: Russell A. D., Hugo, W. B. Ayliffe, G. A, eds principles and practices of disinfection, preservation and sterilization 3rd ed. Oxford. Blackwell scientific publications 95- 123. Sanchez-Ruiz, C., Martinez-Royano, S. and Tejero-Monzon, I. 1995: An evaluation of the efficiency and impact of raw wastewater disinfection with peracetic acid prior to ocean discharge Water Sci. Technol., 32, pp. 159â€“166. Shalaby, H. A., Abd el-Wahab, M. H. and Shalaby, S. I. 2004: Value of hydrogen peroxide and dihydroxybenzol mixture (disinfectant) in eradication of chicken coccidiosis. J. Appl. Vet. Sci. N.R.C., 1(1), 127-138. Shirley, M.W., Smith, A.L. and Blake, D.P. 2007: Challenges in the successful control of the avian coccidian. Vaccine. 25, 5540 - 5547. Watkinson, W. J. 2008: Chemistry of detergents and disinfectants. In Cleaning-in-Place: Dairy, Food and Beverage Operations. 3rd ed. edited by Tamime, A. Y. Blackwell publishing. Williams, R.B. 1997: Laboratory tests of phenolic disinfectants as oocysticides against the chicken coccidiumEimeriatenella. Vet. Record. 141(17), 447-448. Zahran, O. 1979: Studies on the methods of control of rabbit coccidiosis. M.V.Sc. thesis, Faculty of Veterinary Medicine.Cairo University. Hamed Abdel tawab Samaha, Yasser Nasr Haggag, Mohammed Al sayed Nossair, Heba Mohammed Habib. Assessment of The Efficiency of Some Chemical Disinfectants Used in poultry Farms Against Coccidiosis. AJVS. 2013; 39(1): 82-90. Hamed Abdel tawab Samaha, Yasser Nasr Haggag, Mohammed Al sayed Nossair, Heba Mohammed Habib. Assessment of The Efficiency of Some Chemical Disinfectants Used in poultry Farms Against Coccidiosis. http://www.alexjvs.com/?mno=43216 [Access: April 18, 2019]. Hamed Abdel tawab Samaha, Yasser Nasr Haggag, Mohammed Al sayed Nossair, Heba Mohammed Habib. Assessment of The Efficiency of Some Chemical Disinfectants Used in poultry Farms Against Coccidiosis. AJVS. (2013), [cited April 18, 2019]; 39(1): 82-90. Hamed Abdel tawab Samaha, Yasser Nasr Haggag, Mohammed Al sayed Nossair, Heba Mohammed Habib (2013) Assessment of The Efficiency of Some Chemical Disinfectants Used in poultry Farms Against Coccidiosis. AJVS, 39 (1), 82-90. Hamed Abdel tawab Samaha, Yasser Nasr Haggag, Mohammed Al sayed Nossair, Heba Mohammed Habib. 2013. Assessment of The Efficiency of Some Chemical Disinfectants Used in poultry Farms Against Coccidiosis. Alexandria Journal of Veterinary Sciences, 39 (1), 82-90. Hamed Abdel tawab Samaha, Yasser Nasr Haggag, Mohammed Al sayed Nossair, Heba Mohammed Habib. "Assessment of The Efficiency of Some Chemical Disinfectants Used in poultry Farms Against Coccidiosis." Alexandria Journal of Veterinary Sciences 39 (2013), 82-90. Hamed Abdel tawab Samaha, Yasser Nasr Haggag, Mohammed Al sayed Nossair, Heba Mohammed Habib. "Assessment of The Efficiency of Some Chemical Disinfectants Used in poultry Farms Against Coccidiosis." 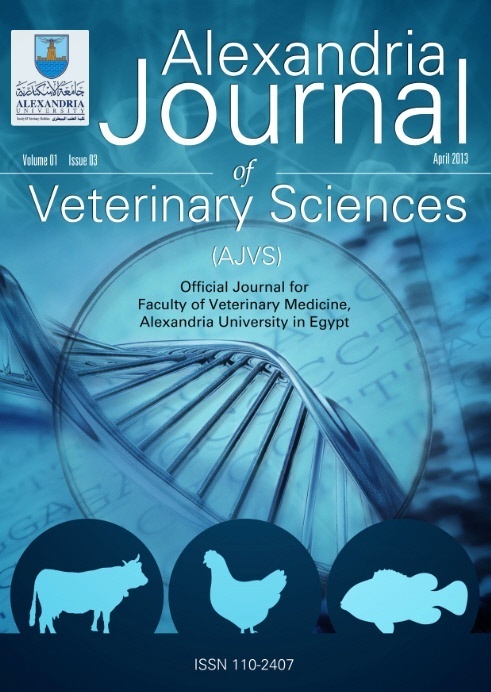 Alexandria Journal of Veterinary Sciences 39.1 (2013), 82-90. Print. Hamed Abdel tawab Samaha, Yasser Nasr Haggag, Mohammed Al sayed Nossair, Heba Mohammed Habib (2013) Assessment of The Efficiency of Some Chemical Disinfectants Used in poultry Farms Against Coccidiosis. Alexandria Journal of Veterinary Sciences, 39 (1), 82-90.